American Morse Code — also known as Railroad Morse—is the latter-day name for the original version of the Morse Code developed in the mid-1840s, by Samuel Morse and Alfred Vail for their electric telegraph. The "American" qualifier was added because, after most of the rest of the world adopted "International Morse Code," the companies that continued to use the original Morse Code were mainly located in the United States. American Morse is now nearly extinct—it is most frequently seen in American railroad museums and American Civil War reenactments—and "Morse Code" today virtually always means the International Morse which supplanted American Morse. Carnival (see other spellings and names) is a Western Christian and Greek Orthodox festive season that occurs before the liturgical season of Lent. The main events typically occur during February or early March, during the period historically known as Shrovetide (or Pre-Lent). Carnival typically involves public celebrations, including events such as parades, public street parties and other entertainments, combining some elements of a circus. Elaborate costumes and masks allow people to set aside their everyday individuality and experience a heightened sense of social unity. Participants often indulge in excessive consumption of alcohol, meat, and other foods that will be forgone during upcoming Lent. 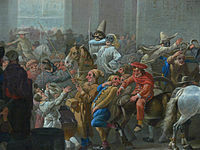 Other common features of carnival include mock battles such as food fights; expressions of social satire; mockery of authorities; costumes of the grotesque body that display exaggerated features such as large noses, bellies, mouths, phalli, or elements of animal bodies; abusive language and degrading acts; depictions of disease and gleeful death; and a general reversal of everyday rules and norms.The term Carnival is traditionally used in areas with a large Catholic presence, as well as in Greece. In historically Evangelical Lutheran countries, the celebration is known as Fastelavn, and in areas with a high concentration of Anglicans (Church of England/US Episcopal Church), Methodists, and other Protestants, pre-Lenten celebrations, along with penitential observances, occur on Shrove Tuesday or Mardi Gras. In Slavic Eastern Orthodox nations, Maslenitsa is celebrated during the last week before Great Lent. In German-speaking Europe and the Netherlands, the Carnival season traditionally opens on 11/11 (often at 11:11 a.m.). This dates back to celebrations before the Advent season or with harvest celebrations of St. Martin's Day. Licensed under Creative Commons Attribution 2.0 (Jeff Weese). Christmas is an annual festival commemorating the birth of Jesus Christ, observed most commonly on December 25 as a religious and cultural celebration among billions of people around the world. A feast central to the Christian liturgical year, it is preceded by the season of Advent or the Nativity Fast and initiates the season of Christmastide, which historically in the West lasts twelve days and culminates on Twelfth Night; in some traditions, Christmastide includes an Octave. Christmas Day is a public holiday in many of the world's nations, is celebrated religiously by a majority of Christians, as well as culturally by many non-Christians, and forms an integral part of the holiday season. In several countries, celebrating Christmas Eve has the main focus rather than Christmas Day. Although the month and date of Jesus' birth are unknown, by the early-to-mid fourth century the Western Christian Church had placed Christmas on December 25, a date that was later adopted in the East. Today, most Christians celebrate on December 25 in the Gregorian calendar, which has been adopted almost universally in the civil calendars used in countries throughout the world. However, some Eastern Christian Churches celebrate Christmas on December 25 of the older Julian calendar, which currently corresponds to January 7 in the Gregorian calendar, the day after the Western Christian Church celebrates the Epiphany. This is not a disagreement over the date of Christmas as such, but rather a preference of which calendar should be used to determine the day that is December 25. Although it is not known why December 25 became a date of celebration, there are several factors that may have influenced the choice. December 25 was the date the Romans marked as the winter solstice, the shortest and darkest day of the year, and the first day in which the days would begin to elongate and the Sun would have a longer presence in the sky. Jesus was identified with the Sun based on an Old Testament verse, and the date is exactly nine months following Annunciation, when the conception of Jesus is celebrated, which is one theory on what may have influenced the timing of the Christmas holiday. Also, Ancient Romans had a series of pagan festivals near the end of the year, and Christmas may have been scheduled at this time to appropriate, or compete with, one or more of these festivals. Some scholars disagree with this latter interpretation and state that the Roman Emperor Aurelian placed a pagan celebration on December 25 in order to compete with the growing rate of the Christian Church, which had already been celebrating Christmas on that date. The celebratory customs associated in various countries with Christmas have a mix of pre-Christian, Christian, and secular themes and origins. Popular modern customs of the holiday include gift giving, completing an Advent calendar or Advent wreath, Christmas music and caroling, lighting a Christingle, viewing a Nativity play, an exchange of Christmas cards, church services, a special meal, and the display of various Christmas decorations, including Christmas trees, Christmas lights, nativity scenes, garlands, wreaths, mistletoe, and holly. In addition, several closely related and often interchangeable figures, known as Santa Claus, Father Christmas, Saint Nicholas, and Christkind, are associated with bringing gifts to children during the Christmas season and have their own body of traditions and lore. Because gift-giving and many other aspects of the Christmas festival involve heightened economic activity, the holiday has become a significant event and a key sales period for retailers and businesses. The economic impact of Christmas has grown steadily over the past few centuries in many regions of the world. Licensed under Creative Commons Attribution 2.0 (François Rejeté). The Christmas season, also called the festive season, or the holiday season (mainly in the U.S. and Canada; often simply called the holidays), is an annually recurring period recognized in many Western and Western-influenced countries that is generally considered to run from late November to early January. It is defined as incorporating at least Christmas, and usually New Year, and sometimes various other holidays and festivals. It also is associated with a period of shopping which comprises a peak season for the retail sector (the "Christmas (or holiday) shopping season"), and a period of sales at the end of the season (the "January sales"). Christmas window displays and Christmas tree lighting ceremonies when trees decorated with ornaments and light bulbs are illuminated, are traditions in many areas. In the denominations of Western Christianity, the term "Christmas season" is considered synonymous with Christmastide, which runs from December 25 (Christmas Day) to January 5 (Epiphany Eve), popularly known as the 12 Days of Christmas. However, as the economic impact involving the anticipatory lead-up to Christmas Day grew in America and Europe into the 19th and 20th centuries, the term "Christmas season" began to become synonymous instead with the traditional Christian Advent season, the period observed in Western Christianity from the fourth Sunday before Christmas Day until Christmas Day itself. The term "Advent calendar" continues to be widely known in Western parlance as a term referring to a countdown to Christmas Day from the beginning of December. Beginning in the mid-20th century, as the Christian-associated Christmas holiday and liturgical season, in some circles, became increasingly commercialized and central to American economics and culture while religio-multicultural sensitivity rose, generic references to the season that omitted the word "Christmas" became more common in the corporate and public sphere of the United States, which has caused a semantics controversy that continues to the present. By the late 20th century, the Jewish holiday of Hanukkah and the new African American cultural holiday of Kwanzaa began to be considered in the U.S. as being part of the "holiday season", a term that as of 2013 has become equally or more prevalent than "Christmas season" in U.S. sources to refer to the end-of-the-year festive period. "Holiday season" has also spread in varying degrees to Canada; however, in the United Kingdom and Ireland, the phrase "holiday season" is not widely synonymous with the Christmas–New Year period, and is often instead associated with summer holidays. Licensed under GNU Free Documentation License 1.2 (Prathyush Thomas). Licensed under Creative Commons Attribution-Share Alike 2.0 (/kallu from Helsinki, Finland). A Christmas decoration is any of several types of ornamentation used at Christmastime. The traditional colours of Christmas are pine green (evergreen), snow white, and heart red. Blue and white are often used to represent winter, or sometimes Hanukkah, which occurs around the same time. Gold and silver are also very common, as are just about any other metallic colours. Typical images on Christmas decorations include Baby Jesus, Father Christmas, Santa Claus, and the star of Bethlehem. Typical winter icons include snowflakes, snowmen, icicles, and even penguins and polar bears. In many countries, such as Sweden, people start to set up their Advent and Christmas decorations on the first day of Advent. Liturgically, this is done in some parishes through a Hanging of the Greens ceremony. In the Western Christian world, the two traditional days when Christmas decorations are removed are Twelfth Night and if they are not taken down on that day, Candlemas, the latter of which ends the Christmas-Epiphany season in some denominations. Leaving the decorations up beyond Candlemas is historically considered to be inauspicious. A Christmas gift or Christmas present is a gift given in celebration of Christmas. Christmas gifts are often exchanged on Christmas Day itself, December 25, or on the last day of the twelve-day Christmas season, Twelfth Night (January 5). The practice of giving gifts during Christmastide, according to Christian tradition, is symbolic of the presentation of the gifts by the Three Wise Men to the infant Jesus. Licensed under Creative Commons Attribution-Share Alike 4.0 (Jirka.h23). A number of Midwinter or Christmas traditions in European folklore involve gift-bringers. Mostly involving the figure of a bearded old man, the traditions have mutually influenced one another, and have adopted aspects from Christian hagiography, even before the modern period. In Slavic countries, the figure is mostly Father Frost. In Scandinavia, it is an elf-like figure or tomten who comes at Yule (and who sometimes also takes the form of a goat). In Western Europe, the figure was also similar to an elf, developing into Father Christmas in the modern period in Great Britain. In German-speaking Europe and Latin Europe, it became associated with the Christian Saint Nicholas. In some parts of Central Europe, there is a separate tradition of a young child or fairy-like being bringing presents, known as Christkindl. From these European traditions, the North American figure of Santa Claus developed, beginning in the 1820s. The American figure in turn had considerable influence on the various European traditions during the 20th century.